Keep it Klassy, Salem! : Bad Lawyering? Lawyers Rebecca Whitehill and Joseph Collins argued that Nolan had no justification for a search. Collins said Gray-Santana does maintenance for the building where both men live and that they were simply heading to Home Depot to buy paint for Cruz's apartment. So let me get this straight. 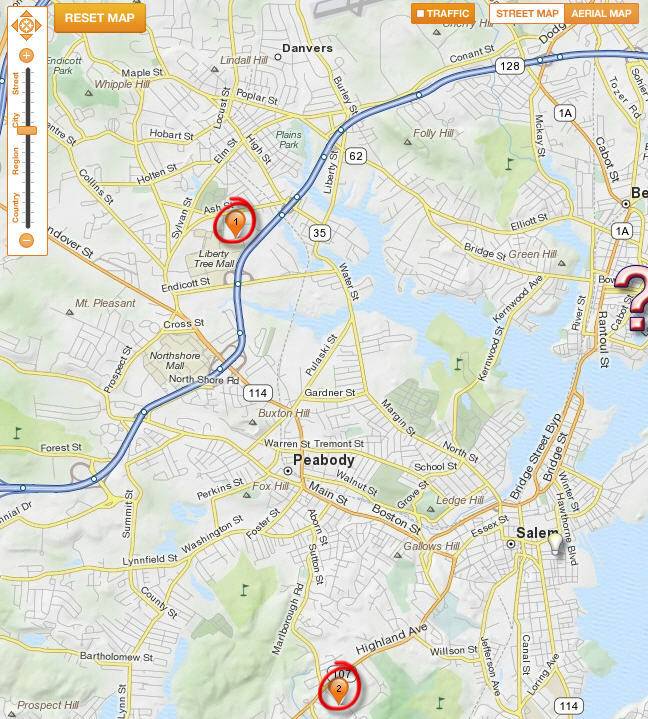 Two criminals, who live on Palmer Street, were driving to Home Depot for paint (without a valid license), and they were on Cabot Street in Beverly? That's about as plausible as the story that he was delivering pizza in his pizza-less, dog-filled car. When I inevitably get arrested, and let's face it, it's only a matter of time, I won't be calling those two. The lightbulb represents where the alleged perps live. The red circles are the two closest Home Depots. The ? is Cabot Street, where the arrest occurred. I go to Home Depot a lot. Never by Cabot Street. See what I mean? Maybe they should have stuck with the pizza delivery story. At least then they'd only be caught in one lie.